Our experts use Building Management Solutions to help our Customers increase equipment efficiency and reduce energy costs in Commercial and Industrial buildings. According to the EPA, as much as 35% – 50% of building energy is consumed in one place – the Central Chilled Water Plant. Your plant also presents the biggest opportunity for increased savings. 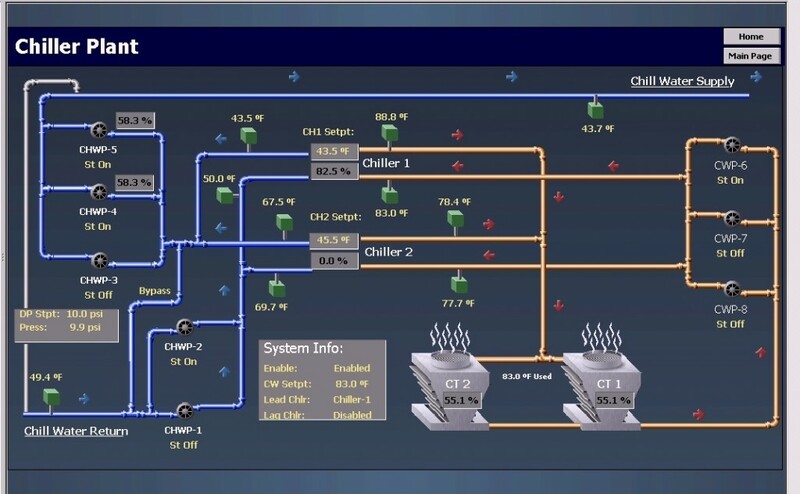 In order to become more energy efficient, a facility plant and equipment must be designed and operated as a single, integrated system. Building Automation Systems provide building control through integration. Your building’s climate, lighting, energy consumption, scheduling and other controllable features can be programmed and managed by the Building Automation System (BAS). SAVE ENERGY Coordinate all energy consuming loads in your building – from HVAC & lighting systems to manufacturing operation-to save energy and extend the life of valuable equipment. CONTROL COSTS You can assess the amount of energy your building is using and where it is being used, so you can make the most educated decisions concerning your building’s operation. INCREASE PRODUCTIVITY Provide a comfortable and energy-efficient working environment for your employees that utilizes energy only when and where it is needed. ELIMINATE EXTRA WORK Manage activities and information in the most efficient manner. Remote access via the web allows you to easily connect to your building – regardless of where you are in the world. View the operating conditions of your plant equipment with just one touch – from ANYWHERE – via internet access. “Precision Air has become an essential partner in the successful and efficient operation to our HVAC plant, energy management system and the entire operation of the facilities.